Religious NGOs at the United Nations: Polarizers or Mediators? 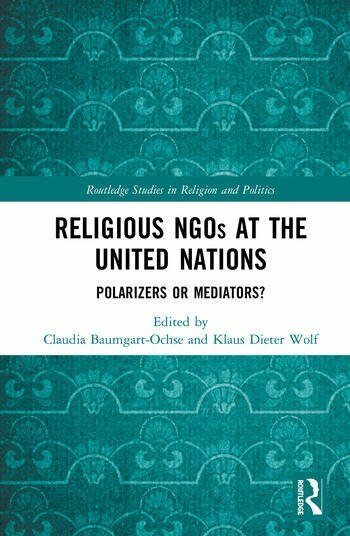 Examining the involvement of religious NGOs (RNGOs) at the UN, this book explores whether they polarize political debates at the UN or facilitate agreement on policy issues. The number of RNGOs engaging with the United Nations (UN) has grown considerably in recent years: RNGOs maintain relations with various UN agencies, member-state missions, and other NGOs, and participate in UN conferences and events. This volume includes both a quantitative overview of RNGOs at the UN and qualitative analyses of specific policy issues such as international development, climate change, business and human rights, sexual and reproductive health and rights, international criminal justice, defamation of religions, and intercultural dialogue and cooperation. The contributions explore the factors that explain the RNGOs’ normative positions and actions and scrutinise the assumption that religions introduce non-negotiable principles into political debate and decision-making that inevitably lead to conflict and division. Presenting original research on RNGOs and issues of global public policy, this volume will be relevant to both researchers and policy-makers in the fields of religion and international relations, the United Nations, and non-state actors and global governance. 1. Introduction: Religious NGOs at the UN: Polarizers or mediators? 3. Religious NGOs at the UNFCCC: A specific contribution to global climate politics? 9. Religious NGOs at the UN: Advancing interreligious dialogue and cooperation? Dr Claudia Baumgart-Ochse, Peace Research Institute Frankfurt, Germany. Prof Dr Klaus Dieter Wolf, Peace Research Institute Frankfurt, Germany.